If you ignore a problem long enough, it'll just go away, right? OK, probably not � and "cross your fingers and hope" isn't the best approach to resolution. In 8-ball, it's especially dangerous to put things off. If an object ball is going to be a pain in the neck, its shadow only grows larger as you clear other balls. At last winter's Accu-Stats Make-It-Happen 8-Ball Invitational, which gathered six all-world players for a round-robin event in New Jersey, Shane Van Boening backed himself into a corner in his match against frequent foe Dennis Orcollo. With the table open and trailing the American, 5-4, in the race-to-10, Orcollo tried to sink a stripe while breaking up the 10-12 cluster in the top left corner of the table (as shown in the diagram to the right). Orcollo missed the shot while leaving the two-ball cluster intact. Van Boening sank his first stripe, but the cue ball couldn't break up the 10 and 12. Now, in the position shown in the diagram, he had limited options with only three object balls left. With a slight angle on the 11 into the right side pocket, Van Boening sent the cue ball off the left long rail. It barely missed the 8 and clipped the left side of the 12. 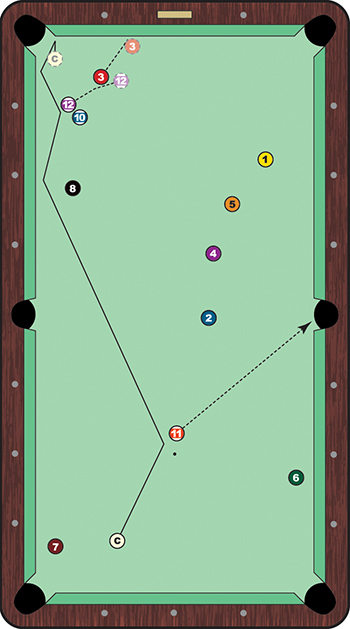 As the cue ball rattled off the point of the pocket, the 12 rolled into position for a shot in the top right corner. Van Boening waited to deal with his problem balls � but some extraordinary cue ball control opened up the rest of the table. Orcollo, though, proved to be a larger complication, as the Filipino came back to win the match in the case game, 10-9.